Mushroom-picking is one of Russia’s favourite pastimes. Easy to cook, the ‘Forest Gift’ makes for a delicious appetizer. Mushrooms are essentially a real gift of the forest and I love them. In India, we only have two types of mushrooms: button and oyster mushrooms. In Russia, on the other hand, there are more than 300 different varieties of mushrooms. Lactarius, Chanterelles, Oyster mushrooms, Bolete, Honey mushrooms and Milky Cap are among the most popular types of mushrooms to gather. When I was a kid, I used to go with my grandfather to the forest for mushroom picking. We would take a basket, a stick, some food to eat, catch the train and wait when as it took us far away from the city. I would sit next to the window and watch the scenery that comprised of the trees, the lakes, the bushes and lonely village houses. We would get off at some station where the forest is deep and there are hardly any people. Our hunt was for mushrooms. From my childhood, I knew so many different types of mushrooms, which ones are edible and which ones are poisonous. There are so many mushrooms: some of them grow on wooden logs, some only in the birch forests, some grow as a family under the shades in the middle of the field and some hide under the top layer of soil and can be found with a long stick scraping the ground. We would be walking through the dense forest for about 4-5 hours and collect so many mushrooms, that it would take the whole day to prepare them. Very happy moments! 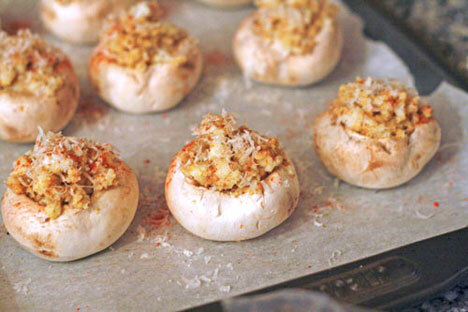 I would like to share with you one of my favourite mushroom preparations: Baked stuffed mushroom. We used to serve this dish at Rolls United (our restaurant in Bangalore) under the name ‘Forest Gift’ and it became a hit among our Indian customers. 1. Wash mushrooms from dirt and remove the stems. Turn the head of the mushroom upside down and slightly cut the sides to make it flat. Chop the stems into small cubes. 2. Chop onion and garlic into small pieces and fry till golden brown in sunflower oil. You can add green chilli if you want it to be spicy. 3. Scrape the carrots and add to the onion together with chopped mushroom stems and cuts from mushroom heads. Fry till it is cooked. 5. Prick the caps with the fork and add the filling into it. Scrape some cheese on the filled mushroom caps. 6. Bake it in the oven at 200C for 20-30 minutes or until its done.